Homathko River-Tatlayoko Protected Area comprises 17,575 hectares of diverse landscape, incorporating low elevation coastal rainforests and wetlands. Unique features of the surrounding area include the spectacular Waddington Canyon on the Homathko River, extensive icefields, and the aquamarine Tatlayoko Lake, with its impressive mountain backdrop. The Protected Area also incorporates valuable wildlife habitat, including the Mosley Creek wetlands and valley migration corridors through the Coast Range. Homathko River-Tatlayoko Protected Area was designated through the Cariboo Chilcotin Land Use Plan. The spectacular mountain scenery of the area offers remote recreational opportunities for the experienced backcountry user, ranging from hiking, kayaking, and mountaineering to photography and wildlife viewing. The Homathko River-Tatlayoko Protected Area is a spectacular wilderness area, but is remote and access is difficult. There are no trails or roads within the Protected Area. Tatlayoko Lake is accessible by boat, and there is a road and a forestry recreation site along the eastern shore of the lake. 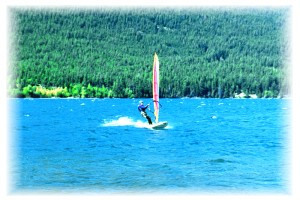 There are boating opportunities on Tatlayoko Lake, and consistent afternoon thermal winds also create good windsurfing conditions. The Homathko River is considered too dangerous for canoeists, kayakers, or rafters. High winds can make the lake hazardous to small boats; stay close to shore. The Homathko River is too rough for whitewater rafting and kayaking. The Protected Area is located approximately 175 km west of Williams Lake and 30 km south of Tatla Lake. The area can be accessed by gravel road off Highway 20 near Tatla Lake. For additional map information, please refer to topographical map numbers: 1:50,000 92N/6, 92N/7, 92N/8, 92N/9, 92N/11, and 92N/2. Only experienced canoeists and kayakers should attempt Tatlayoko Lake. Windy conditions are common and may result in dangerously high waves. Paddling on the Homathko River is dangerous, and is not recommended. Wild, indigenous bull trout are found in Mosley Creek, Dumbell Lake and the Homathko River. Dolly varden and rainbow trout are also abundant. Anyone fishing or angling in British Columbia must have an appropriate licence. Horses can be brought in for hunting. This park is open to hunting. Please refer to the BC Hunting and Trapping regulations for more information. Horses can be brought in for hunting. Pets/domestic animals must be under control at all times. Backcountry areas are not suitable for dogs or other pets due to wildlife issues and the potential for problems with bears. This lake is very cold and windy, therefore not very inviting to swim in. There are no lifeguards on duty at provincial parks. It is possible to windsurf on this lake due to the high winds that arise. However, the water is very cold and uninviting.